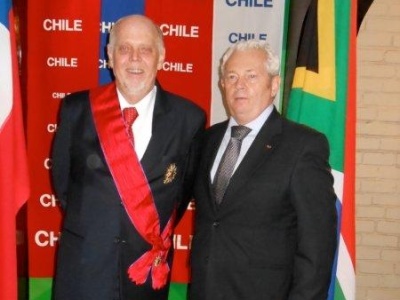 A senior executive at Africa’s largest independent defence and aerospace business, Paramount Group received the highest state order that can be bestowed by the President of Chile on foreign citizens, in recognition of his diplomatic service as South African Ambassador. Victor Zazeraj was decorated with the Great Cross of the Order of Bernardo O’Higgins during a ceremony held at the Chilean Ambassador’s residence in Pretoria. A career diplomat with high level postings across the globe, Victor Zazeraj played an important role in shaping and strengthening the relations between South Africa and Chile. His last post was as South African Ambassador to Chile between 2004 and 2008. During that period of time he was involved in strengthening and deepening ties of friendship and cooperation between the two countries. He played an active role in developing commercial, political, and cultural ties with Chile. He also had the privilege of organizing the state visit, to the country, by former president Thabo Mbeki. During Victor’s posting closer military ties were established including visits by South African naval vessels to Chile, closer cooperation in technology, astronomy, ocean sciences and increased trade and investment with numerous South African businesses investing in the country. The award was established in 1965 and named after one of the founders of the Chilean State, General Bernardo O’Higgins, who was also the leader in the struggle for independence by the Spanish colonies in America in 1810-1826.